I love the fall and all of the parties that come with it. Taking a break from Bridal Fashion Week, I got to indulge in Spain's tastiest exports at the Spain's Great Match event in Manhattan. I was able to explore the various wine regions of Spain and the rich wines, sherry, and Cava they produce. The big star of the event? Olives From Spain. I never knew they were so versatile. 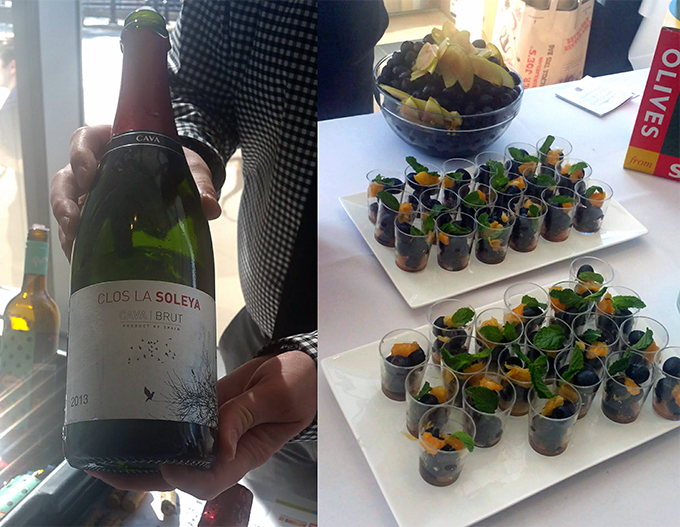 Rushing between photo shoots, I was ecstatic to try the delicious offerings at the Spain's Great Match event. I am currently planning a huge party at the end of the month and searching for great nibbles that are appropriate for Halloween. I needed food that looked good, tasted better and easy to prepare. The most surprising bite of the event was the combination of black olives, oranges, and fresh mint. Not only did these have seasonal colors, but the flavors were also terrific and paired perfectly with Spanish wine. Olives are an ancient food whose domain spans Europe, Africa, and Asia. It is not a surprise then that a significant range of global cuisines use olives. They encompass a full range of tastes in salty, sweet, bitter and sour for the perfect umami element in your dish. I learned that olives are generally classified by when they are harvested and how they are processed. There are many varieties of olives, but only a few types are actually eaten as a table olive instead of being pressed for olive oil. 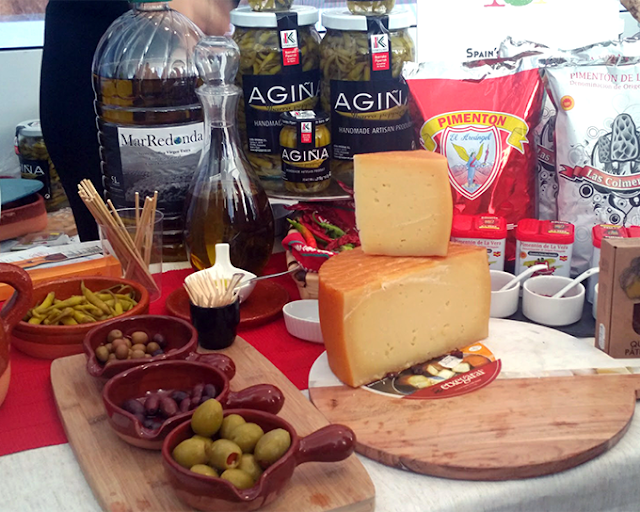 I loved all the Spanish cheeses of the event, starting from Manchego to Iberico. Another tasty combination that paired well with Rioja wines were the big green olives tossed with marinated red peppers and stuffed with Cabrales cheese. 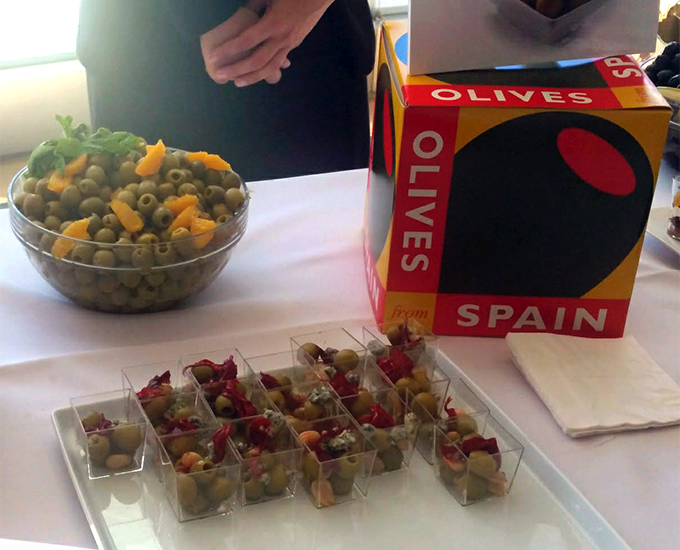 Stuffed olives are one of the easiest hors d'oeuvres you can put together for your event. You can stuff them with cheese, pimientos, anchovies or really get creative with them. The Olives From Spain site has an extensive list of recipes from top chefs, most of them are easier than they look. If you need a bit of escapism this week, grab a bottle of wine and a lovely board of cheeses, Jamon Iberico, and delectable olives from Spain to make a night of it. If you are coming to my next party, you know what will be in store! Disclosure: This is a sponsored post written by me on behalf of Olives from Spain.